Indiscretions follows the path of U.S. avant-garde film and video from the underground of the 1960s to the academy of the 1980s. 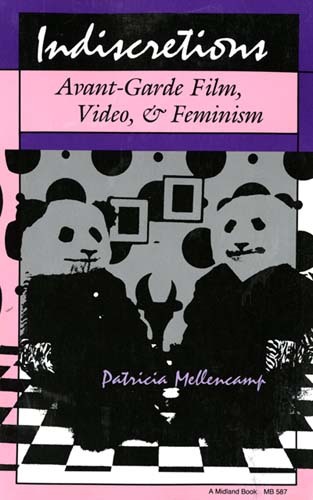 Patricia Mellencamp traces and charts the intersections of Lacanian psychoanalysis and the desiring male subject, Roland Barthes and texts of pleasure, Michel Foucault and the disciplinary society, the grotesque body and Mikhail Bakhtin, the rhizomatic alogic of Gilles Deleuze and Felix Guattari, and the female subject of feminist film theory. She creates a dialogue among theory and popular culture and politics through inventive readings of the films of Owen Land, Hollis Frampton, Ken Jacobs, Bruce Conner, Robert Nelson, Michael Snow, Yvonne Rainer, and Sally Potter, and videotapes by Ant Farm, TVTV, Michael Smith, William Wegman, and Cecelia Condit. At Indiana University Press, we want to publish books that will matter twenty or even a hundred years from now—books that make a difference today and will live on into the future through their reverberations in the minds of teachers and writers.